Today is our monthly office potluck, so I decided to pack a small bento for breakfast, since there was no need for me to pack a lunch. Since I still have a ton of rice leftover from Wednesday, I decided to make a small batch of fried rice. With three quail eggs left in the fridge, I figured I should use up a couple so that they don’t go to waste. I’ll figure out what to do with the last one for something to do on Monday. I used my Aluminum Totoro Bento Box from J-List. There’s only one left in stock, so if you want it, get it now! It’s a tiny little thing, but I love it regardless because it’s got a cute cover, a great shape, and is a great size for little kids. 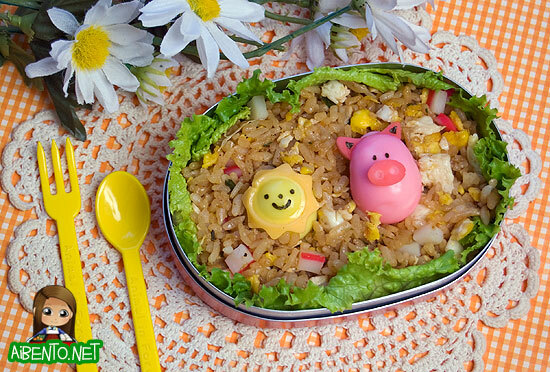 To make this little sun and piggie, I pulled out the quail egg cutter wheels that Maki gave to me in September when we did the photo shoot for Yum-Yum Bento Box . I forgot to take a picture of them, but there are two wheels and shapes for a lot of different animals. I chose to do the sun and the pig. First I boiled the eggs, cooled them, and then peeled them. I dyed one in yellow food coloring and another in red food coloring in water. I took a slice of kamaboko and threw it in the pink water with the pig. I used the wheel to cut the ears out, then cut a slit in the egg to insert it. 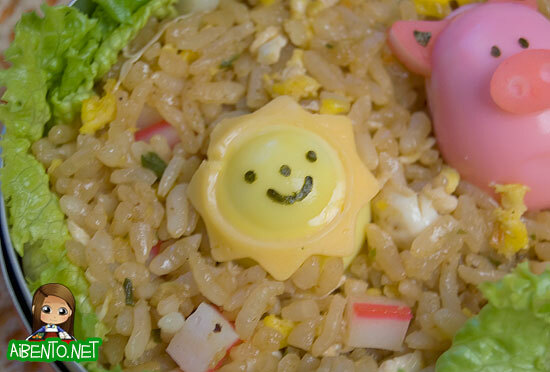 Since kamaboko is pretty sticky, it stuck to the egg without needing to put mayo. 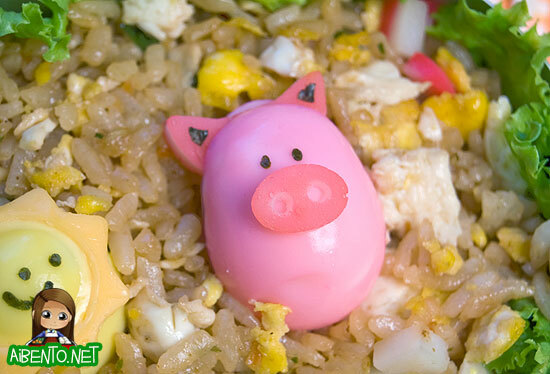 I punched out nori eyes and ears, then dug a little hole in the fried rice and put the piggie in. Buddy ate the piggie the second I told him I was done with the photos. He bit into it and goes, “It’s an egg! !” I think he was shocked because it was so tiny. This photo came out terrible and you can see that the cheese was melting by this point. The cheese ring was actually really hard to get out of the wheel, as part of it is covered. I don’t know why it’s designed like that, but I’m sure there’s a reason that I’m just not understanding. I made another hole and squished him in, then applied the nori face. 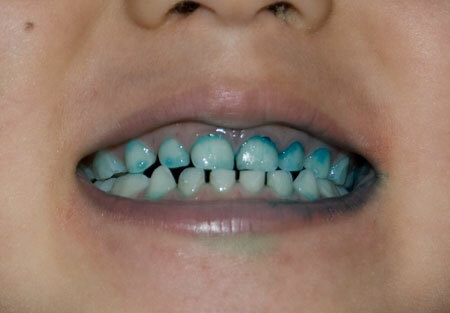 Since I used food coloring, I had the box of droppers on the counter. I didn’t know, but Buddy decided to snipe one. The next thing I know, Baby Girl is yelling, “Moooooom! Buddy has the blue thing!” I had no idea what she meant, so I went to go look and he was trying to go hide in my closet, but a container was blocking his way and he couldn’t get there before I saw he had really REALLY blue fingers. 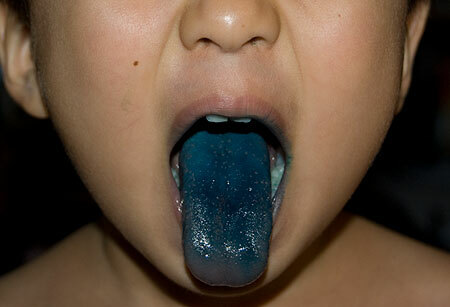 I yelled at him to go wash his hands in the bathroom and as he got closer I saw his mouth…..
Yeah… O.M.G. His teeth were bad too. When I took him to school, his lips were still blue, so I made sure to tell the teachers what happened, lest they think I tried to suffocate him in the car before walking in with him. I suppose this kind of thing is where that saying, “Boys will be boys.” comes from.